I really had no idea there were that many in Toronto. Must be one of those rare sushi franchises here in TO. Anyways, this is my first taste of Ichiban. The place is small and cozy with a traditional bamboo looking decor. We arrived at around 6:30pm and were seated near the window. At that time, it wasn’t that busy. You can’t forget the “Fire Mountain Roll”. 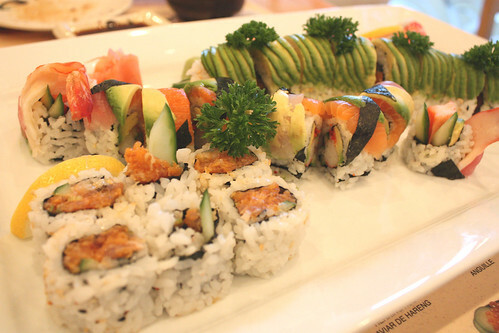 This time we opted to go only rolls route after the last few we focused on the sushi side of things. The food came out pretty quick with the sushi pizza first. It was a bit more spicy as per the description but I found the bed of rice way too hard/crunchy. I think they overcooked it in the deep fryer. 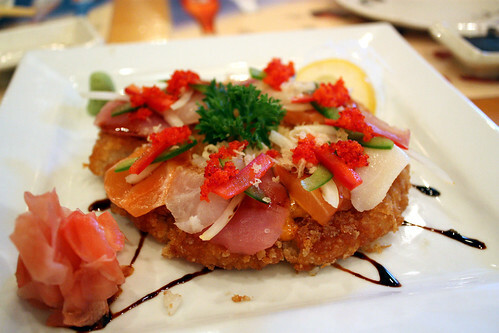 Can I declare Ichiban Sushi House’s spicy salmon sushi pizza the worst sushi pizza in Toronto?… I guess not, until we review every sushi restaurant in the city. However, this one was definitely the worst I’ve had so far. I didn’t even want the rest of the pieces that were sitting there. As you said, definitely too crunchy. Yikes. Not a good start. Well it is definitely the current front runner for the worst sushi pizza in Toronto. The rest of the rolls were served together in a large serving plate. The presentation of all the rolls was nice, especially the caterpillar rolls which were the centre piece of the plate and actually did look like a caterpillar! True, presentation was decent, but at the end of the day (errr, meal) it’s all about taste. Too bad the Ichiban Sushi House didn’t deliver on that. Ok, the Caterpillar roll was actually quite good (I’ll give them that) but the others were not great at all. Spicy tuna roll: ‘meh’; Rainbow roll: ‘ok’; Fire Mountain roll: I didn’t taste anything there—even the texture I didn’t like. I’ll agree with you there. 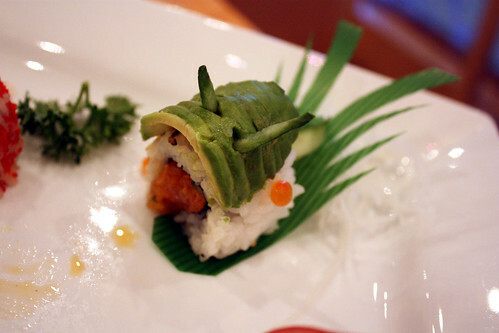 The best out of the bunch was the caterpillar roll. The Fire roll to me was the worst and they didn’t really have any taste or “fire” to them at all. It looks like they just sprinkled some chili spice on it and that was it. I guess you could say they are passable. It looks like this place is going to fall into the “yet another Toronto sushi restaurant” category which are a dime a dozen here. They brought over some cantaloupe for dessert to finish it off. I’m a fan of free fruit. Despite that I’m going to have to give Ichiban Sushi House at Front and Wellington a not-so-big 4 out of 10. That’s even lower than ‘yet another Toronto sushi restaurant’, I believe. 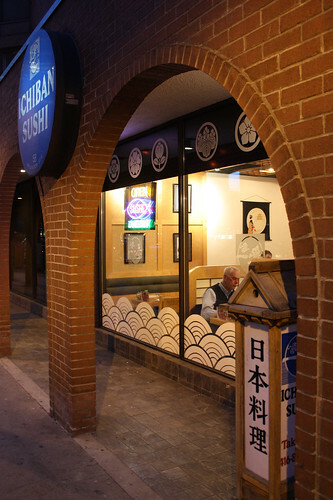 Head up and over a few blocks to Sakura Ichiban at Adelaide and Jarvis for a good sushi experience. Oh, and what’s with the height of the benches along the wall being so much higher than that of the chairs? So, if you sit along the wall on the bench you’re literally a foot higher than those in the chairs – and too high for the table. Weird. 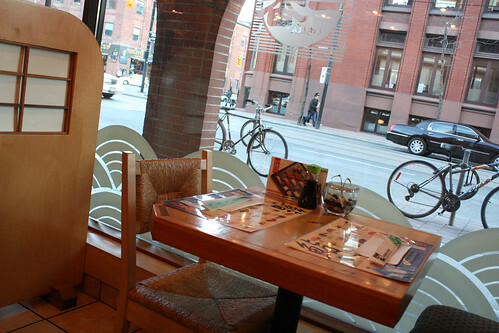 Ha here’s a tip from the pros: If you want to “command the table” at Ichiban Sushi House, get the bench seats ASAP so you can tower over all the other diners! Well the cantaloupe dessert is pretty much the worst for me. I am allergic to it so no instant +0.5 from me! In the end, not the most impressive experience by a long shot. In that area, I actually expected a lot better. 5/10 from me.